As I sat to write this, I thought this is more than a embroidery sampler. It is not just the size which is 96 feet long it is that I have lived with parts of this cloth sitting in my sewing box for years and years as I started doing it in 1996. If you are not aware of the whole back story you will find it here. The reason I say it is more than a regular hand embroidery sampler is that I always enjoy experimenting with hand embroidery stitches even the very basic ones, but as time went on I added more and more snippets of text that marked events in my life. In this area I was playing around with basic stitches. In this case I was working back stitch using a hand dyed thread. This is a blackwork filling pattern but the hand dyed thread gives it a modern twist. This is also back stitch worked as a chevron pattern. Hopefully beginners will see what is possible with some of the basic stitches. The next band of my embroidery sampler is running stitch worked row upon row. The band after that echos the chevron pattern. It is running stitch worked in a zig zag formation. 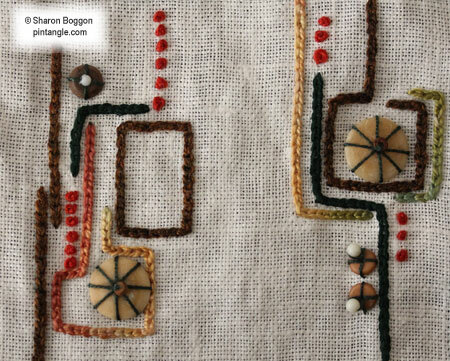 This is mainly stem stitch worked in various weights of thread. Some are cotton perle #5, others are 3 threads of stranded cotton floss, other threads are wool. There are also French knots and the beads are secured with straight stitch. 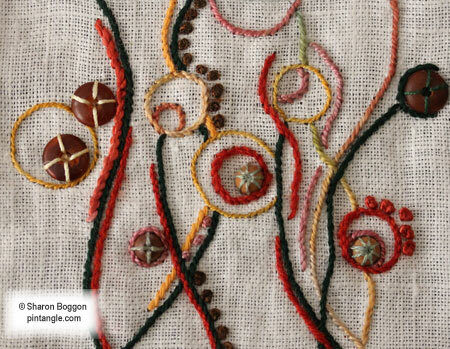 The next area is mainly worked in chain stitch in different threads. There is some hand dyed cotton perle #5, some wool and some linen thread. I also used French knots and once again the beads are secured with straight stitches. I often stitch while watching the evening news. Often snippets are incorporated in my stitching. 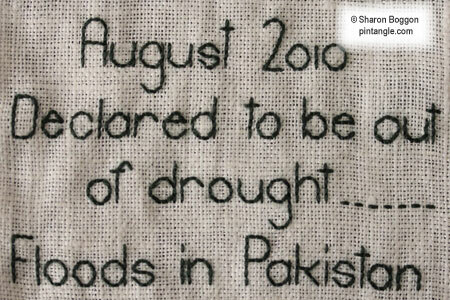 I was pleased to hear that we were declared to be finally out of drought when the next news story was that there were floods in Pakistan. I added this using a dark green perle #8 cotton to work the letters in back stitch. This is another area of back stitch that is worked in cotton thread. 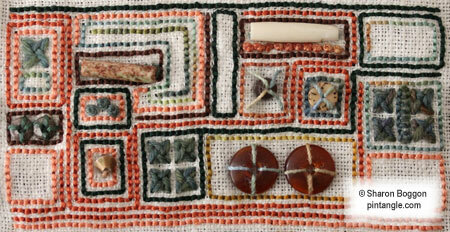 I added big chunky beads and woven cross stitch worked in wool. Love seeing your sampler. Where would we be without your inspiration. It is so beneficial. Thank you. Thanks for sharing the stitches and the journal part, Sharon. Your free form sampler is amazing! I clicked through and read how it came about. I find it so interesting that you have added news snippets and life events to it as well. What a treasure you are creating for yourself and perhaps for others in the future! I do indeed very much enjoy seeing this! I always admire your sampler and I especially love these personal toughes. My own sampler Project (a neverending series of individual samplers each about 1,20m long) includes a lot of little motifs and found objects that mean something to me, but I am rarely as outspoken as you are. Sometimes I wish I was. It’s so good to see what can be done with just a few simple stitches. I like your longer posts about this sampler very much. When I see the neat lettering on your sampler I always wonder how you stitch them. Do you write on your sampler with a water soluble marker or do you use an alphabet? I use a few different blackwork alphabets for my lettering. It’s also a journal as well as a stunning piece of embroidery, you have personal elements and reportage in textural stitch – and I wonder, thinking back, how the events of the day/time affected how you approached the stitching in that particular area?